Self-assembly is the process by which a system of particles randomly agitate and combine, through local interactions, to form larger complex structures. 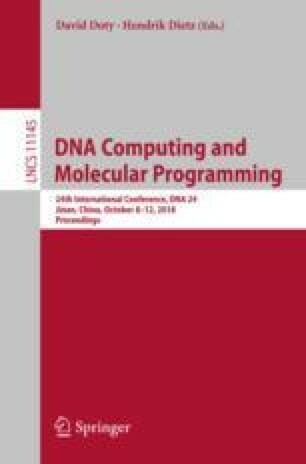 In this work, we fuse a particular well-studied generalization of tile assembly (the 2-Handed or Hierarchical Tile Assembly Model) with concepts from cellular automata such as states and state transitions characterized by neighboring states. This allows for a simplification of the concepts from active self-assembly, and gives us machinery to relate the disparate existing models. We show that this model, coined Tile Automata, is invariant with respect to freezing and non-freezing transition rules via a simulation theorem showing that any non-freezing tile automata system can be simulated by a freezing one. Freezing tile automata systems restrict state transitions such that each tile may visit a state only once, i.e., a tile may undergo only a finite number of transitions. We conjecture that this result can be used to show that the Signal-passing Tile Assembly Model is also invariant to this constraint via a series of simulation results between that model and the Tile Automata model. Further, we conjecture that this model can be used to consolidate the several oft-studied models of self-assembly wherein assemblies may break apart, such as the Signal-passing Tile Assembly Model, the negative-glue 2-Handed Tile Assembly Model, and the Size-Dependent Tile Assembly Model. Lastly, the Tile Automata model may prove useful in combining results in cellular automata with self-assembly. A. Luchsinger, R. Schweller and T. Wylie—This author’s research is supported in part by National Science Foundation Grant CCF-1817602.